It may be an annual affair but each year takes Chinese cuisine to new heights. The 9th Annual Guest Chef Grand Dinner series is back this year with another exclusive guest chef. 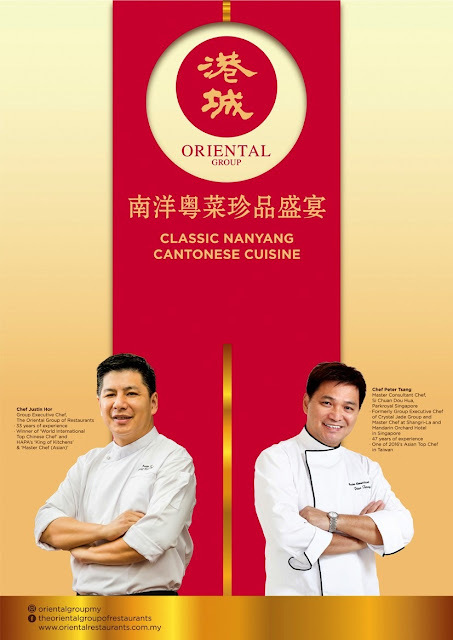 Oriental Group of Restaurants Chef Justin Hor has roped in Hong Kong-born Chef Peter Tsang of Si Chuan Dou Hua Parkroyal Singapore in creating a truly memorable and gastronomical journey in honor of Chinese cuisine in this year’s grand dinner series. “We started our annual Grand Dinners series back in 2008 with the intention of introducing different dimensions of classic Chinese cuisine to the public, whilst educating them on the cultural significance of the selected dishes.” says Chef Justin Hor. A distinguished and passionate chef himself, Chef Hor started his culinary journey at the age of 13 and has headed many reputable restaurants over 33 years in the industry. With many awards under his belt, he is well-known for creating authentic married with new cooking techniques, yet preserving traditional flavours of Chinese cuisine. Fortunate to be able to host this year’s grand dinner series with acclaimed Chef Peter Tsang, both culinary maestros are celebrating the Chinese culinary heritage with two eight-course menus as well as ala carte dishes themed Classic Nanyang Cantonese Cuisine. Gourmands will be taken through a sumptuous journey of culinary heritage elevated with modern presentation of the finest. “It is an honour to share my 47 years of experience and to work together with Justin to create this year’s menu. 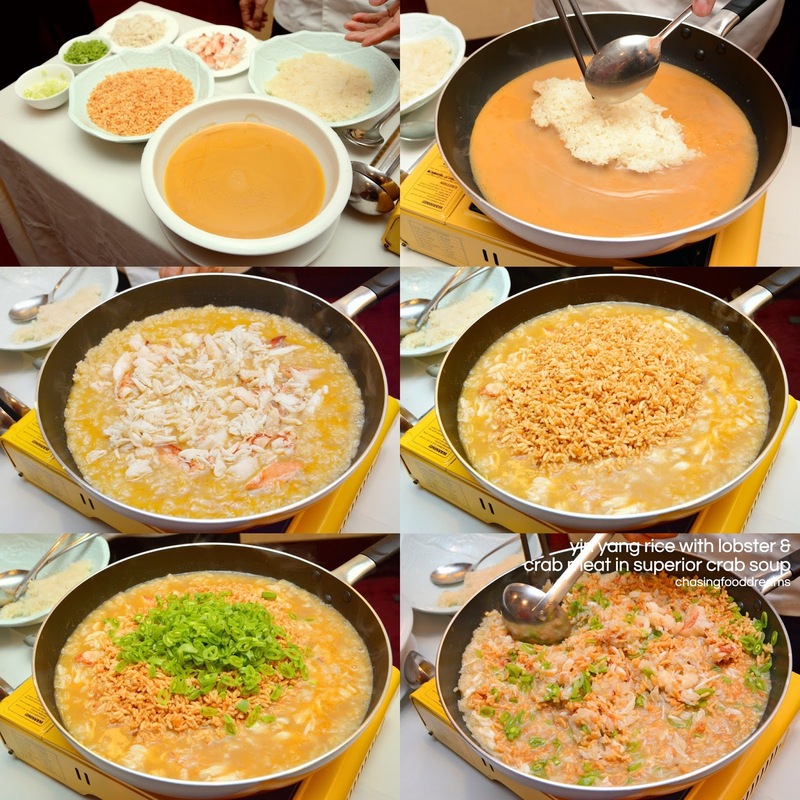 The various cooking methods and combination of ingredients used in the menus are significant as the culinary roots still bear much resemblance and connectivity between the local ‘Nanyang’ community and their Chinese ancestors.” shared Chef Tsang. Chef Tsang, currently the Master Consultant Chef at Si Chuan Dou Hua Parkroyal Singapore, brings a wealth of 47 years of culinary experience to the table. Besides having worked inn some of the finest Chinese kitchen in Asia, he has also cooked for renowned distinguished leaders of the world. In addition to his culinary repertoire Chef Tsang also gives back to the community by being an active organizing member of the annual World Culinary Charity Dinner that raises funds for charitable causes in various countries. Inspired from the little bites of the Chinese cuisine, both Chef Hor and Chef Tsang has created a list of Chinese tapas platter to tease our palates before the main dishes of the set menu arrives. The freshness of the ingredients plays an important element in the Capsicum & Apricot Mushroom in Miso and Chilled Bitter Gourd in Sweet Chili Sauce. Sweet crunchy bites of peppers and earthy mushrooms are cleverly seasoned with umami miso while blanched and chilled thinly sliced bitter gourd, artfully arranged to symbolized a blooming bud is paired with sweet chili sauce to enhance its subtle bittersweet notes. For heat, the classic Chilled Chicken with Szechuan Peppercorn Sauce is deliciously familiar with a very well-controlled numbing heat from the peppercorns. It’s not overly an explosive taste but rather just enough to keep one hankering after it’s spiced up flavours. For a milder heat, the Pork Kyuri Roll with Spicy Sauce might be your best bet. Pork, cooked till firm yet tender, are rolled up with crisp cucumber and doused in piquant sauce, an ode of a blast from the past in Chinese cuisine. Another classic takes form in Liver Sausage & Prawn Roll. Pretty much an old school dish but rendered modern in presentation, the dish was surprisingly delicate in flavours with various pleasing textures. The tiny cherry tomatoes balanced up the strong flavour of the liver sausage well, making the dish easy to enjoy. 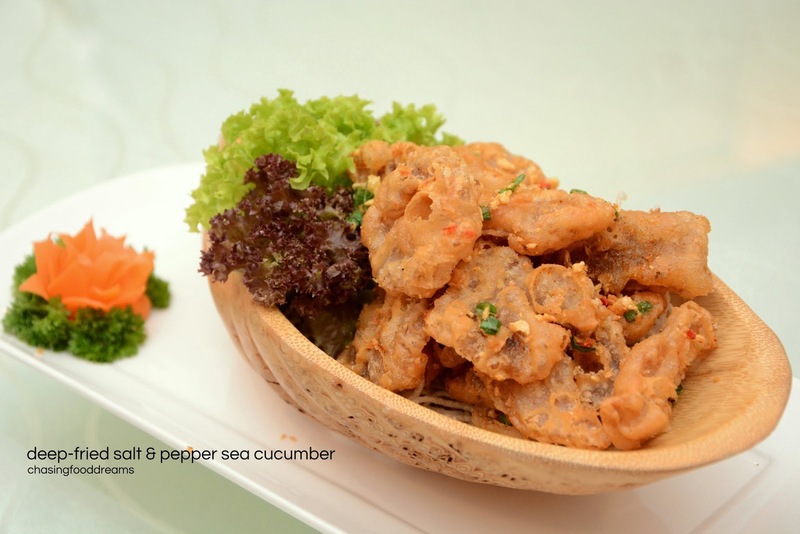 Featuring deep-fried dishes that is much-ordered in many Chinese restaurants, the Deep Fried Salt & Pepper Sea Cucumber is a nice crispy appetizer concocted to evoke joys of savoring the gelatinous sea cucumber. The Radish Cake Typhoon Shelter Style combines another two classics of radish cake turned crispy and jazzed up with the popular aromatics of garlic, onion, chilies and more with Typhoon Shelter style flavours. The first main of the set menu arrives with a lasting impression of Double-Boiled Haruan Soup with Fish Maw served in Paper Wok. Hours of labor goes into a soup of yesteryears, doubled-boiled with the nutritious snakehead fish or haruan. If there is one dish that has withstood the test of time and perhaps that took center stage in Chinese culinary heritage, it would be the Treasures Chest Duck, braised with Abalone & Soft-Boiled Quail Egg. A dish that requires skills of deboning a whole duck while retaining its original shape before stuffing it with bejewels of lotus seeds, barley, mushrooms and salted egg. Each duck, weighing in about 2.2kg, goes through a tedious process of cooking before it’s presented with more lux of braised whole abalones and quail eggs. Melt-in-the-mouth tender duck meat is rendered even better with the loads of creamy, nutty and earthy stuffing. In fact, the duck was so luxuriously delicious, one might even let the abalone take a side seat. The soft-boiled quail egg with a molten egg yolk center was the final standing ovation to the dish. A masterpiece of Chinese cuisine indeed! It nearly felt like Christmas came early when the Crystal-Wrapped Steamed Soon Hock with Radish & Green Ginger was placed on the table. The presentation not only evoked an element of excitement within the child in us but it kept the premium fish nicely hot and steamy. Fresh and large sweet Soon Hock fish along with soft radish pieces goes so well with the piquant green ginger sauce. Chef Tsang personally took us on a quick masterclass of his Scallop in Golden Egg White Soufflé. Inspired by one of his trip in Japan, he enveloped sweet diver scallop in a fluffy egg white soufflé and sprinkled shrimp roe or Har Chee over it. Finishing the broth stuffed with bits of vegetables, the scallop ball was simmered in the broth again till it soaks up the goodness of the broth. The scallop ball was superbly light, almost fluffy with a delicate eggy note enhanced with glorious fresh sweet scallop. The shrimp roe elevated the umami note in the dish well and the wilted spinach gave the dish a lovely finishing of the greens we needed after all the heavier dishes earlier. Chef Tsang also took center stage again when he prepared the Yin Yang Rice with Lobster & Crab Meat in Superior Crab Soup in front of us. A dish he holds dearly in his heart, he spoke about classic dishes from his past and how important it is to maintain authentic flavours while added the need to uplift the dish to our modern culinary palates. Using a ratio of 1/3 of steamed glutinous rice with 2/3 of crispy rice puff, he cooks both in a luxurious crab broth along with sweet chunks of lobster and crab meat till the rice has soaked up all the flavours of that broth. Adding some final touches of French beans and spring onion, the rice looked gloriously majestic and extravagant. A single spoonful of this Yin Yang Rice with Lobster & Crab Meat in Superior Crab Soup reaffirmed the decadent flavours and myriad of textures this dish has. Deemed simply the best course of the evening, there was no doubt that everyone was secretly hoping for an encore of the dish. The journey ended with a sweet and nutritious Chilled Peach Resin in Snow Pear. Peach resin is renowned for beautification purposes while snow pear is good for cooling down the body. It makes perfect sense to end the meal with this dessert on our ode to Classic Nanyang Cantonese Cuisine with Chef Justin Hor and Chef Peter Tsang. Don’t miss this exclusive Grand Dinner by The Oriental Group of Restaurants as the gastronomical journey from Chef Hor and Chef Tsang is truly one of its kind in our culinary scene! The Classic Nanyang Cantonese Cuisine set menu is available at all participating Oriental Group of Restaurants from 21 August to 30 September 2017. Priced at RM1,888 nett per table of 10 pax and RM3,888 nett per table of 10 pax. Diners can enjoy these dishes on ala carte basis from 25 August to 30 September 2017. Reservations are encouraged for the Classic Nanyang Cantonese Cuisine with Chef Justin Hor & Chef Peter Tsang as some dishes require time to prepare.